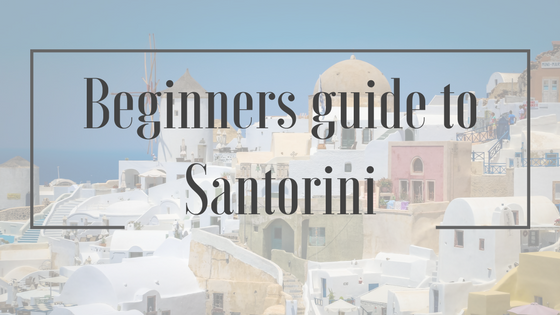 A few months back I wrote this post about 'reasons why I can't wait to visit Santorini'. Now that I have actually visited this beautiful island I thought I would write a beginners guide as there are a few things I wish I knew about beforehand! Don't go too late in autumn or too early in spring. Towards the end of September storms start to hit and most places are closed. Too early like April may not be the hottest and there maybe a few showers here and there. Due to this I booked this trip for May. There were a few cold windy days but no showers during my stay, but most of the time the weather was around 20-23 degrees, which is actually pretty hot when you come from UK! We were lucky with the weather as the forecast kept changing every day from cloudy to sunny. I did a lot of research when I came to book this holiday. I looked at different areas of Santorini and opted to stay in Fira. This is due to the easy access of transport, restaurants, shopping and to be close to the caldera views. I also looked at staying in Kamari and Perissa, which are very popular amongst tourists due to the beach, however I came here for the views so Fira was the best option for me. I would of loved to stay in Oia but it is way to expensive! Imerovigli is another area where I looked into, but after reading many reviews I found out to find some variations of places to eat at a reasonable price, you would have to walk to Fira, however if you want the views of Oia for cheaper then Imerovigli is the place to be. Now that I have visited Santorini, and if I were to go again, I would most definitely stay in Kamari! The beach there with sunbeds are amazing, there are plenty of restaurants and the weather seemed to be a lot better there compared to Fira. There's so much to see in Santorini, make sure you plan while your at the hotel about what you want to do for the day. This will ensure you get to see everything you came here to see. We were like we have '7 days here, its plenty, lets chill for the first two/three days', but guess what? We kind of wished we didn't just stay at the resort and laze around as theres plenty to see and do. Do not go all inclusive. I mean it's perfect if your just planning to stay at your resort but Santorini is a place to explore and not really that beach type place. There are plenty of restaurants in Fira that I will be recommending in my 7 day Santorini diary post so be sure to check them posts out. Wear sensible shoes ladies and gents. On Instagram you will see these beautiful pictures of people wearing high heels and dresses with the lovely views in the background. Now I am wondering how did they walk on the unlevelled stoned ground and that so, up hill with plenty of steps here and there! Or did everyone just change their shoes once they reached the top?! Well don't make my mistake, if you want to take those perfect Instagram shots make sure to wear sensible footwear, trust me it will make your life a lot more easier, and carry your glamorous heels with you until you reach the top then a quick change before clicking the picture! Take euros with you. I found it so much easier to pay by cash than thomas cook cashcard which bare in mind charges a fee for withdrawing. I don't know if the locals just prefer cash as it's easier for payments. Hire a quad bike. There are plenty of places that you cannot get to as buses don't go there so you will need access to a vehicle. Quad bikes cost €20 a day and that includes fuel which we found lasted us for the day. Be sure to check insurance and the rules behind the company which you rent from. Take your best camera! One thing I regret not taking with me is my DSLR! I took my Sony A5100 but really wish I took my DSLR for those crisp images. After all it's a holiday of a life time. Try the gyros here! I've had lamb doner and lamb gyro and both were amazing, the seasoning they add and the way they cook it, just makes it dissolve in your mouth. If your vegetarian then there are options for you too like falafels in pitta bread which I've heard are lovely too. They only cost around €3 so a bargain for a quick bite and delicious at the same time. I would recommend the place called 'gyros' and 'falafel vegetarian' in Fira, on the main strip. It's one shop but divided into two so one side for non vegetarians and the other for vegetarians. They even add fries into the pitta bread for that extra touch. The airport departure queue is massive. You can be waiting for 1 hour plus to check in so I would recommend to spend time at the restaurant and then when the queue is shorter to join back. This will ensure comfort as we spent ages waiting around. Finally, use sunscreen all over your body!! Whether it looks sunny or not as we ended up with sun burns!